I recall in about 1997, during one of my early forays around Manhattan with Irwin Hochberg in search of funds for the Middle East Forum, his showing me a handsomely typed-out schedule of his day. Irwin being the president of a sizable accounting firm, I would have supposed his hours filled with customers, colleagues, and other of his "day-job" obligations. But no, every last activity that day was in some way devoted to philanthropy – helping me, helping others, teaching a class, making an investment, doing administration – advancing the welfare and security of Israel. Similarly, I once attended a dinner honoring Irwin where the host, a non-profit that raises funds for Israel, produced a high-quality and detailed biographical video of his life that not once or in any way indicated what his job was. I mention these incidents because they revealed to me the extraordinary extent to which Irwin had devoted his time and his passion to the cause of Israel. As the film suggests, his for-profit business provided the financial means and social base for his work, which in turn defines his life. 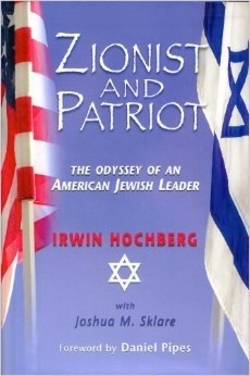 Cover of "Zionist and Patriot: The Odyssey of an American Jewish Leader." Now this, his memoir, explains how that quite remarkable state of affairs has come about. Interesting in its own right – for Irwin Hochberg is an important figure in U.S.-Israel relations – the larger significance of his story lies in the trajectory of how not just he but thousands of successful professionals in the United States have, over the decades, dedicated themselves to Israel. Since Zionism became a communal cause in the 1930s, individuals like Irwin have written checks, hosted parlor meetings, organized events, caucused with visiting Israelis, traveled to Israel, learned deeply about the Middle East, developed the political arguments, and lobbied in Washington. Before Israel's independence in 1948, as Leonard Slater documented in his 1970 book, The Pledge, they even smuggled a military infrastructure for the Yishuv's force, Haganah. Their generosity starts with money but goes far beyond that; pro-Israel work, as Irwin details in the pages to follow, is a quasi-full-time undertaking, one that drives everything from one's morning reading to one's evening social schedule. Irwin and the other volunteers both maintain the rich texture of the Zionist-Diaspora bond and provide its political sinews. To take just one example, note the case of Gordy Zacks, longtime chairman of the R.G. Barry Corporation of Columbus, Ohio, a comfort footwear manufacturer, whose close and sustained relationship with George H.W. Bush meant, according to his biography, that he "declined an ambassadorship in the Reagan/Bush Administration, and a Cabinet post during the Bush/Quayle Administration, in order to serve as unofficial adviser and confidant to Vice President and then President Bush. Once a month, he met privately with Vice President and then President George H.W. Bush to discuss Israeli/American relations, the Middle East Peace Process, Soviet Jewry, and the political landscape of the American Jewish community." It is safe to say that such involvement is unique anywhere, anytime. For U.S.-Israel relations to retain their historic strength, however, new generations of activists will need to rise up and replace their elders. Prevailing wisdom in recent years has bemoaned an indifference to Israel among the younger generation of American Jews. A 2007 study by Steven M. Cohen and Ari Y. Kelman, Beyond Distancing: Young Adult American Jews and Their Alienation from Israel, wears its thesis in the title. 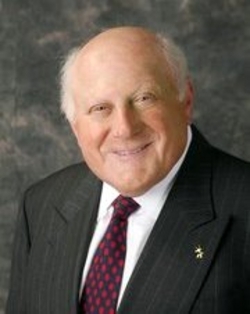 But more recent research, specifically American Jewish Attachment to Israel: An Assessment of the "Distancing" Hypothesis by Theodore Sasson, Charles Kadushin, and Leonard Saxe, disputes this trend. Rather, it argues that "age-cohort differences in attachment to Israel are likely related to lifecycle rather than the diverse experiences of successive generations. As American Jews grow older, they tend to become more emotionally attached to Israel." Not coincidentally, Irwin only got fully involved in his 50s. I hope his example, eloquently revealed in the pages ahead, will inform and inspire others. Feb. 3, 2014 update: I regret to report that Gordon Zacks, whose remarkable career I described above passed away on Feb. 1. Oct. 11, 2017 update: And today, Irwin Hochberg died, age 89. I met Irwin about thirty years ago at Middle East-oriented conferences. We clicked immediately, so when time came for the Middle East Forum to expand its presence in New York City, it was natural for me to ask him to serve as our chairman, and also for him to accept. Later, when the Forum needed an initial chairman of its executive committee, again he was the obvious leader. He served with distinction for many years in both positions. Irwin was always available to me, always in good humor, always offering the wisdom of his deep experience. My final lunch with him was on Oct. 3, just a week before his passing, where we reviewed everything from Iran policy to the best mix of investments for the Forum. I shall miss him as a friend, a happy warrior, and a teacher. We shall all miss his vitality and good works. Related Topics: Arab-Israeli debate in the U.S.